تحدث عن منتجاتنا جريئة شعار العلامة التجارية تي شيرت طويل الأكمام مصنوع من القطن ذي الوزن جيرسي. 100% قطن جيرسي ممشط مغزول حلقي ً ا. تقليم مضلع بألياف لدنة المسبق للاحتفاظ بالشكل. بدون ملصقات الجزء الخلفي من الرقبة لمزيد من الراحة. Caterpillar والقطة على الأكمام مطبوع على الصدر. مزخرف برقعة الشعار في الدرزة الجانبية. This is the first time I have bought this brand for my Husband .We purchase mostly Carhartt his preferred brand for many years but after reading some reviews I decided to order this.The quality seems to be good .Seems very close to the same thickness material wise as Carhartt.I did buy large which is his normal size but seems to be a little big but no big deal because with Winter right around the corner this is perfect for layering thermals under this. The shirt itself looks really nice on him and it's definitely a great work shirt. I would consider ordering more. 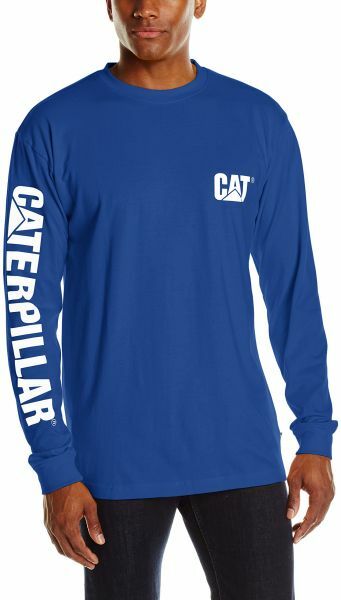 If you have a man in your life who loves CAT, he will love this shirt! My boyfriend always wears and XL, so I ordered him one and while it is a little small, it still fits him. It's nicer than most of his Carhartt shirts are so he wears it often. It looks and feels great. It even has a tab on the back below the neckline for your headphones to go through, although he doesn't use that. It's a good price and any man would love it. Bought these CAT shirts for my husband who has a bunch of other CAT shirts. These were slightly larger than the other shirts he had, but not enough to exchange. They did not shrink after washing so if you prefer more snug fitting shirts, I suggest you go a size down. Bought 3 as Christmas gifts. Everyone of the guys LOVED them! My husband wears his almost every weekend. It looks really sharp! The quality is very good, and the fit is good I think. It might be a little big on him, but still looks good. My youngest, however said the sleeves were just right for him because he has trouble getting long enough sleeves...but the neck was a little big. So it's a matter of person size. All in all, we love them, are very happy, and plan to purchase again. Sizes well & is a great quality shirt. Speaking as a US Steelworker & growing up around all my Dad's Caterpillar heavy equipment. It goes w/o saying that I enjoy all CAT branded apparel & its just as tough & rugged as a D9. Just writing this review has me remembering the first time I loaded the Dozer on the Lowboy pulled by our U model MACK Truck.